We Need Trees … Win This Tree! CAAV promoted the benefits of trees and gave away a flowering cherry tree for downtown Harrisonburg’s PARKlet PROJECT Friday evening, October 4 from 5- 8pm.Thanks to Cathy Strickler for the idea and energy behind our spot. Planting trees remains one of the most cost-effective means of drawing excess CO2 from the atmosphere. Congratulations to Charlotte whose name was drawn from the pot of 27 names to win the tree! If you have ever been walking in the sun on a hot city street and then come into the cool shade of a big tree, then you probably intuitively know some of the benefits that trees offer. The following 8 reasons to plant a tree were gratefully adopted from The Urban Tree Book, by Art Plotnik. 1. Trees produce oxygen. A mature leafy tree produces as much oxygen in a season as 10 people inhale in a year. 2. Trees help to clean the air. Trees help cleanse the air by intercepting airborne particles, reducing heat, and absorbing air pollutants including carbon monoxide, sulfur dioxide, and nitrogen dioxide. 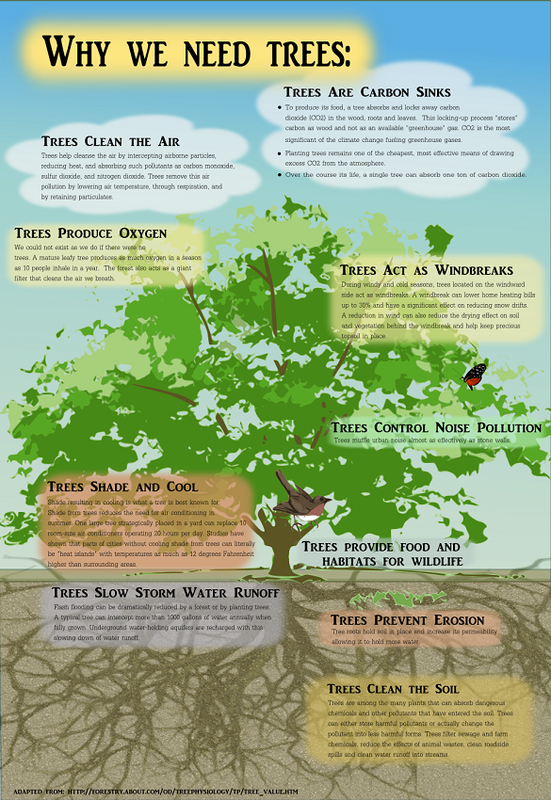 Trees reduce and remove air pollution by lowering air temperature, through respiration, and by retaining particulates. Evergreen conifers, such as pine trees, produce slightly higher levels of nitrogen dioxide and therefore broadleaf trees, such oaks and maples, are recommended for maximum air quality benefit. 3. Trees become “carbon sinks”:To produce its food, a tree absorbs and locks away carbon dioxide, a global warming gas. An urban forest is a carbon storage area that can lock up as much carbon as it absorbs, until the leaves (or the trees) fall and rot. 4. Trees shade and cool: Shade from trees reduces the need for air conditioning in summer. In winter, trees break the force of winter winds, lowering heating costs. Studies have shown that parts of cities without cooling shade from trees can literally be “heat islands,” with temperatures as much as 12 degrees Fahrenheit higher than surrounding areas. 5. Trees act as windbreaks: During windy and cold seasons, trees act as windbreaks. A windbreak can lower home heating bills up to 30%. A reduction in wind can also reduce the drying effect on other vegetation behind the windbreak. 6. Trees fight soil erosion: Trees fight soil erosion, conserve rainwater, and reduce water runoff and sediment deposit after storms. 7. Trees make effective sound barriers: Trees muffle urban noise almost as effectively as stone walls. Trees, planted at strategic points in a neighborhood or around your house, can abate major noises from freeways and airports. 8. Trees increase property values: Real estate values increase when trees beautify a property or neighborhood. Trees can increase the property value of your home by 15% or more. Planting a tree leaves a legacy that you and your children can visit as the years go by, reminiscing about how you used to be the same height, marveling as the tree grows, and basking in the coolness and shade on a hot summer day. Thanks to Patti Nylander, Senior Area Forester, Virginia Department of Forestry, for our handouts “to help people take better care of their urban trees,” including 24 Ways to Kill a Tree.